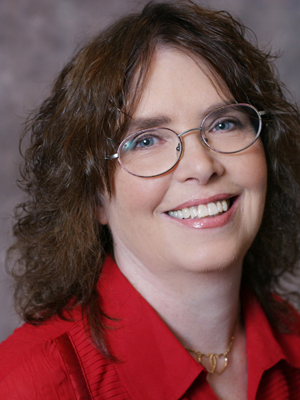 Please welcome historical author, Jacki Delecki to the blog. 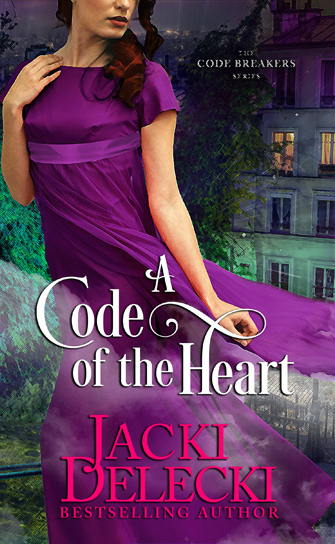 This is Jacki’s first time visiting, and she’ll be giving away an ebook copy of her latest book, A Code of the Heart, and an audio copy of one of her other books. All you have to do is tell her you want it. First the cover. I love that purple. Miss Amelia Bonnington has been in love with her childhood hero since she was nine years old… or so she thought until a not-so proper impassioned and unyielding kiss from the not-so honorable and equally disreputable Lord Derrick Brinsley, gave her reason to question the feelings of the heart. And last, but not least, an excerpt. Amelia Bonnington braced herself as the crowd bumped and pushed, straining to get close to His Highness. The crème of society shoved and elbowed, politely of course, since one would never want to be accused of bad manners. The Prince Regent stood on a small platform at the front of the ballroom, elaborately decorated for Christmas. Heavy bows of greenery and bells hung on red velvet throughout the room. Hundreds of beeswax candles burned. No expense had been spared for the house party celebrating His Royalty’s visit. Amelia had no desire to be part of the Prince’s retinue, a ghastly group who were only interested in themselves and their own pleasure. She sucked in the little air left in the room and pushed, politely, of course, toward the door. The crowd and the heat were unbearable. She never swooned, but with the strong smell of perfume and the hot pressing bodies, she felt tonight might be her first. A maelstrom of sensations and emotions enveloped her. The last days of upheaval must have had a greater effect on her than she had wanted to believe. Her whole world had been turned upside down and twisted sideways at this house party. In the last two days, her friends had been poisoned and kidnapped, and she had been ensnared in the French villain’s trap. She needed to escape from this crowded room. She needed fresh air and open space. A gentleman used the chaos in crowded room to take liberties with her person. After spending years in congested ballrooms, she fully recognized the scoundrel’s ploy to press against her. His heavy eyelids didn’t conceal his roving eyes, focused down her décolletage. As his eyes remained fixated on her breasts, he grabbed her elbow pretending to help her when, in fact, he intended to pull her closer against his heavy, malodorous body. She was about to dig her heel into the supposed gentleman’s fat toe when suddenly a space opened around her and a smell of fresh air and lime soap surrounded her. The perspiring man stared behind her. His slack mouth and the look of fear on his face were priceless. Relief and something much more potent tingled along her skin. She turned quickly and found herself pressed against the broad chest of the man she had been forced to conspire with to save her friend. “I’ve never thought I’d be happy to see you.” She refused to be like all the other women who’d be grateful to have his attention. His lifted one eyebrow in a sardonic way that she always found irritating. He was too big, too handsome, and too confident that she’d find him irresistible. She’d never let him have the satisfaction that she did find him…almost irresistible. A CODE OF THE HEART coming February 2015! I’m back! First we have lots of winners today, so we’ll start there. Congratulations to Lisa Myers who won a copy of Christi Caldwell’s book More Than a Duke!! Give a hand to Lori Patterson for winning Miranda Neville’s book, The Duke of Dark Desires! And to Jennifer Lowery for winning Marina Gabrielle’s book Royal Regard!! Last, but certainly not least, Barbara Monajem picked three winners for her boxed set, Captivated by a Kiss!! They are Linda Thumb, Pat Walker Pinkston, and Patricia Wissore!! As you know, we had been in Ft. Lauderdale waiting for a weather window. The morning we were supposed to leave, squalls developed in the Bahamas. So we resigned ourselves to depart the next morning and did some last minute shopping. When we returned, the squalls had dissipated. It was already after 3PM, but we decided to go and finally left Ft. Lauderdale, after being held up by a cruise ship, around 5PM. 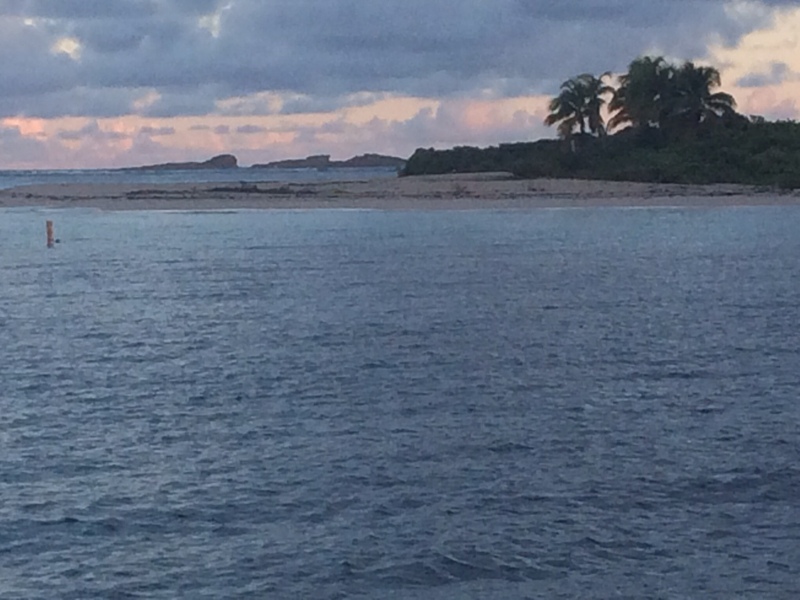 We passed out of the Bahamas late the next day, and were in open water for the rest of the nine day trip. This is our first sunrise at sea. My seasickness passed on the third day, just like everyone said it would. For the first few days we ate the passage meals I’d prepared, navy been soup and Boeuf Bourguignon. After that, we cooked. Which worked well until our wind indicator stopped working. That was the night Hubby decided to grill. 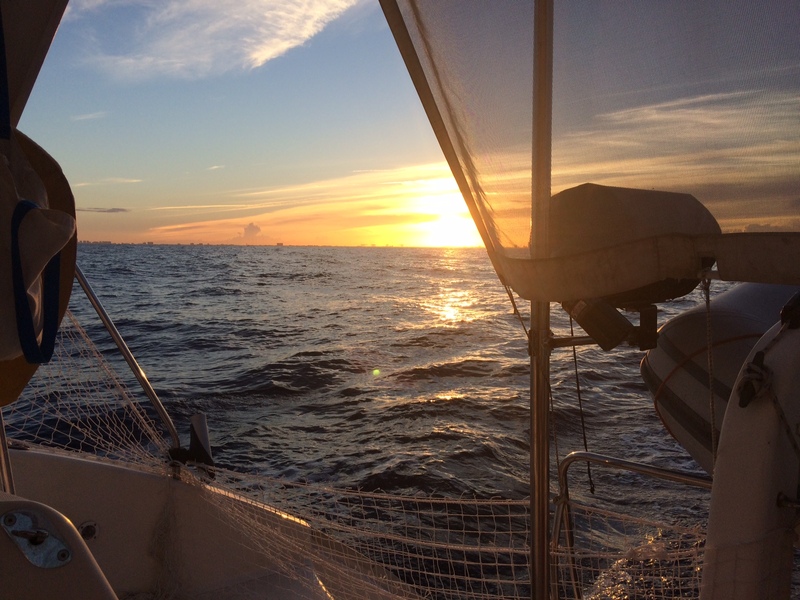 All of a sudden the winds and seas kicked up, and we had to reef the mainsail. But because it was already dark, and we had no idea what the winds were, he wanted to take the sail down and motor. He no sooner put the chicken on the counter than a swell hit us broadside, and the chicken went flying. Fortunately, I had just cleaned the floor. Unfortunately, that was the end of it. We ended up just putting the rice, green beans, and chicken in one pot. It was a very uncomfortable night. Next the outhaul (the thing that holds the sail on the boom) broke, and damaged the wind generator. 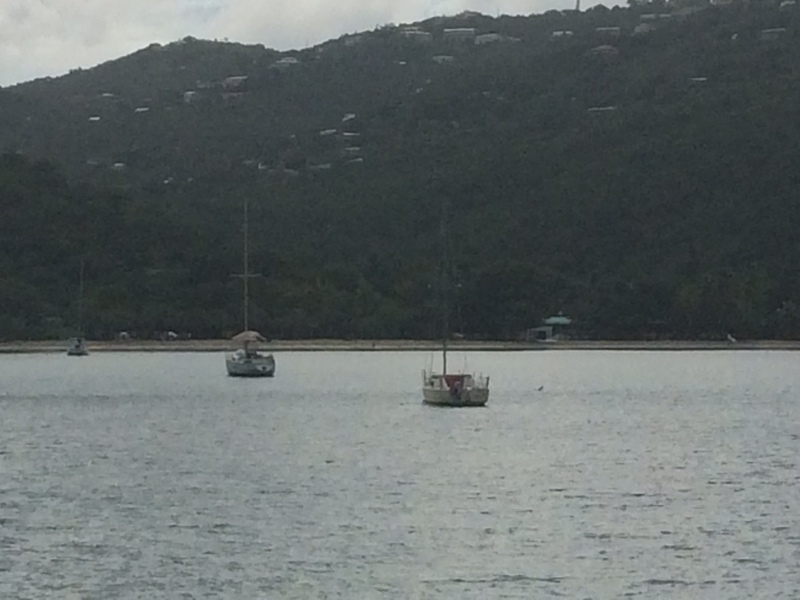 So we ended up completing the trip with the sail reefed. Days on end with nothing but water can be pretty boring, but I was able to get a lot of writing done. 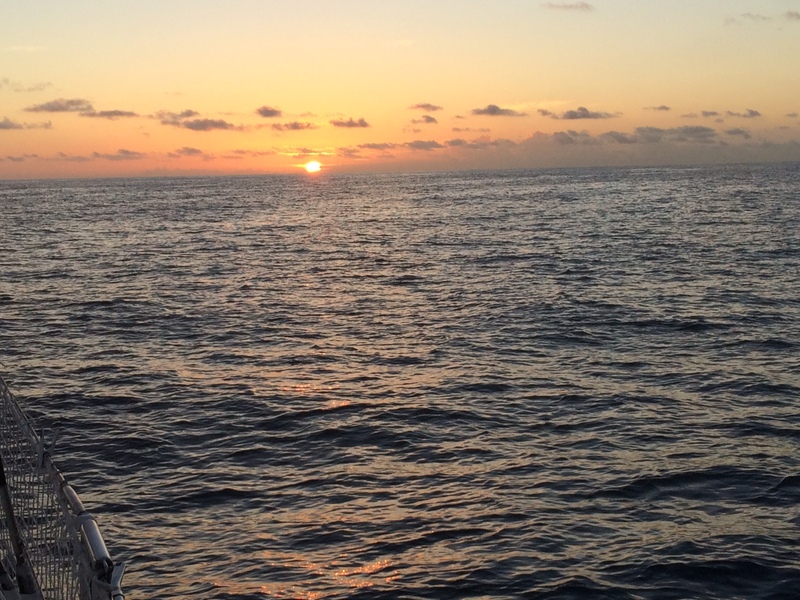 We stopped by Puerto Rico for fuel and had our first experience anchoring in the dark. This is what we woke up to. 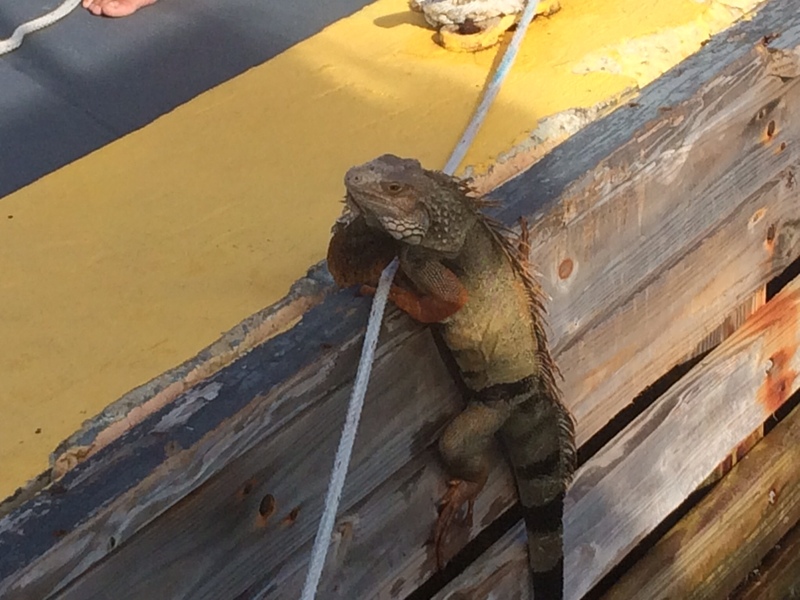 This guy was bound and determined that we weren’t kicking him off the fuel dock. We are now home on our mooring at least for a little while. Now I just need to finish the last few chapters of the book and edit it, complete the copy-edits on Lady Beresford’s Lover, and the galleys on A Kiss for Lady Mary. What were you doing while I was gone? Please welcome historical author Mariana Gabrielle to the blog. 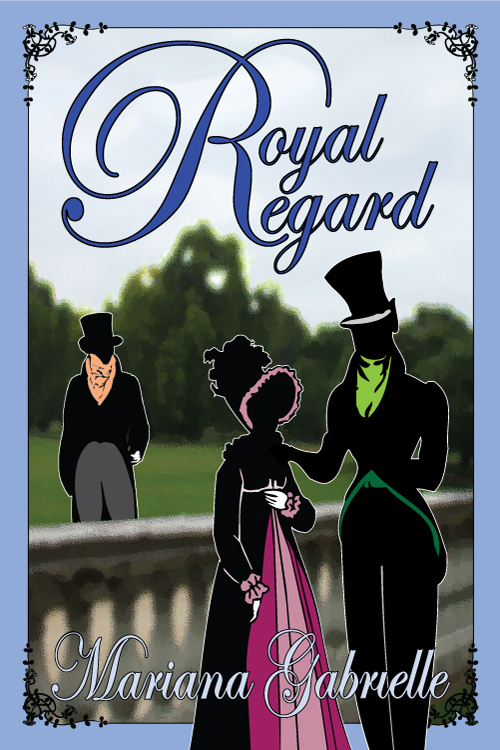 Mariana is here to tell you about her new book, Royal Regard! And she is giving a way a copy to one of you. All you have to do is tell her you want it. As always, we’ll start with the lovely cover. Bella’s slipper caught on the waxed floor, throwing her off-balance. Taking advantage of the opportunity, he caressed her barely bared collarbone. She nearly fell, pulling away, so he held her waist more firmly, drawing her closer to encourage her shivers and gooseflesh. He stared down at her ripe mouth, wishing they weren’t in the middle of a crowded ballroom. 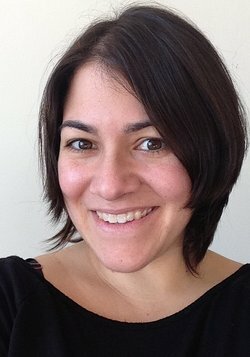 Please welcome the amazing Regency author Barbara Monajem back to the blog!! Barbara is here to tell you about her latest book which is part of a boxed set!! She is giving away a copy to one of you who tells her you want it! Let’s start with the cover! Wanted: respectable, fearless widow to serve as governess to two children in remote Lancashire location. Spartan conditions, haunted house, fair pay. Inquire at the Duck’s Head, Rawden. How desperate would you have to be to answer an ad like that? It’s the early 1800s. You’re an out-of-work governess living in the south of England, and Lancashire is in the north, which means a long journey which you can’t afford. The advertisement doesn’t tell you who your employer will be. You just have to show up at an inn called the Duck’s Head in a remote village, and inquire about the job—which may or may not be available by the time you get there. Judging by the ad, your prospective employer is a bit crazy. (Haunted house? What nonsense!) On the other hand, the ad is up front about the Spartan conditions, and maybe ‘fair pay’ really will be fair. And you haven’t found anything else, so this is your last hope. On top of that, it’s less than a month to Christmas, which is usually your favorite time of year. This year definitely won’t be the best Christmas ever…or will it? And here’s an excerpt. Edwina has just arrived at her new employer’s house. Her employer was Richard Ballister? Richard recovered himself and handed the waiting man a coin. “Thank you, Joseph. Off you go before it starts to pour.” He grabbed Edwina’s valise and with a curt motion of the head, indicated that she should follow him indoors. She hesitated. Death from exposure to the elements―for the first fat drops had already begun to fall―or from mortification? A wave of nostalgia rolled over her. Typical, no-nonsense Richard Ballister—one thing she had always loved about him. She didn’t love him anymore—that went without saying; one couldn’t love a liar and a jilt—but a few good memories lingered amongst the utterly miserable ones. She went inside, and he slammed the door behind her. Before she could move, he loomed over her, large and threatening, trapping her between himself and the door, and another shudder of memory went through her. He hadn’t changed much: tall and darkly handsome, with a sensual curl of the lips and half-hooded, appraising eyes. Why must desire rear its foolish head at such a time? “What the devil are you doing here?” he said. “Wise of you,” he drawled. She wanted to hit him. “If you had any consideration at all, you would have arranged for the governess to apply to an agent in London, rather than spend her every last farthing traveling to the middle of nowhere.” To find the one man she loathed most in the entire world. “Every last farthing?” He rolled his eyes. He blinked, taking it in. She didn’t blame him for being surprised. At the time of her marriage, her late husband had indeed been wealthy. Richard’s lips curled into an evil smile. “Well, but you’ve got a ha’penny left, didn’t you say?” He threw his head back and laughed. It wasn’t a choice after all—she would perish of both mortification and the cold and wet. She whirled and wrenched open the door. Rain lashed in, soaking her skirts. She grabbed her valise, which Richard had dropped—he was still laughing, the disgusting brute―and marched out into the downpour. 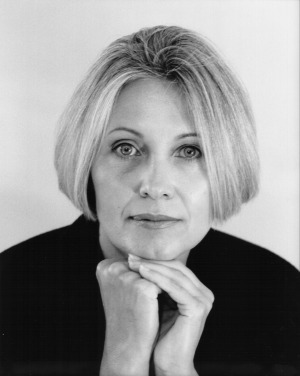 Please welcome the amazing Regency author, Miranda Neville to the blog!! Miranda is giving away a copy of her latest book, The Duke of Dark Desires, to one of you. All you have to do is leave a comment saying you want it. Without further to do, let’s get to the fabulous cover!! She watched him go with some trepidation, leaving her alone with Denford. He took a place at the table and, as though he had all the time in the world, poured himself some coffee. She ought to be safe from her unruly desires at nine o’clock in the morning with the humdrum accouterments of breakfast spread on the table; nevertheless she averted her eyes from his lips on the rim of the china cup. Miranda Neville grew up in England, loving the books of Georgette Heyer and other Regency romances. Her historical romances include the Burgundy Club series, about Regency book collectors, and The Wild Quartet. She lives in Vermont with her daughter, her cat, and a ridiculously large collection of Christmas tree ornaments. Please welcome the wonderful Christi Caldwell back to the blog! 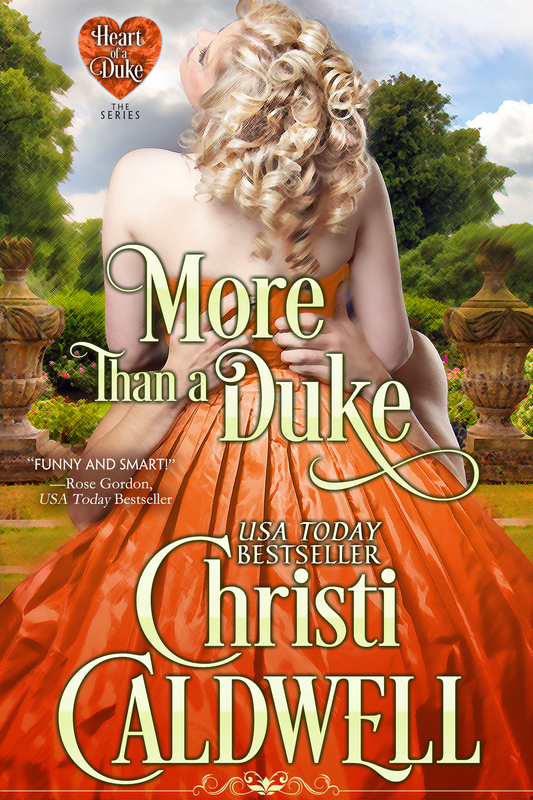 Christi is giving away a copy of her latest book, More Than A Duke , to one of you. If you want to be included in the drawing, leave a comment telling her you want the book. How easy is that? As always, we’ll begin with the lovely cover. Polite Society doesn’t take Lady Anne Adamson seriously. However, Anne isn’t just another pretty young miss. When she discovers her father betrayed her mother’s love and caused her family descent into poverty, Anne comes up with a plan to marry a respectable, powerful, and honorable gentleman— a man nothing like her philandering father. Armed with the heart of a duke pendant, fabled to land the wearer a duke’s heart, she decides to enlist the aid of the notorious Harry, 6th Earl of Stanhope. A scoundrel with a scandalous past, he is the last gentleman she’d ever wed…however, his reputation marks him the perfect man to school her in the art of seduction so she might ensnare the illustrious Duke of Crawford. Harry, the Earl of Stanhope is a jaded, cynical rogue who lives for his own pleasures. Having been thrown over by the only woman he ever loved so she could wed a duke, he’s not at all surprised when Lady Anne approaches him with her scheme to capture another duke’s affection. He’s come to appreciate that all women are in fact greedy, title-grasping, self-indulgent creatures. And with Anne’s history of grating on his every last nerve, she is the last woman he’d ever agree to school in the art of seduction. Only his friendship with Anne’s sister compels him to help. What begins as a pretend courtship, born of lessons on seduction, becomes something more leaving Anne to decide if she can give her heart to a reckless rogue, and Harry must decide if he’s willing to again trust in a lady’s love. A lock toppled free from the collection of ringlets artfully arranged by Anne’s maid. She brushed the strand back. It fell promptly back over her brow. The earl collected that single curl between his fingers and studied the strand bemusedly. “A ringlet,” he murmured. His lips twitched as though he found something of the utmost hilarity in her gold ringlet, immediately snapping her from whatever momentary spell he’d cast. She swatted at his fingers. “What is wrong with my ringlets?” She knew there was a more pressing matter to attend. But really, what was wrong with her ringlets? The earl narrowed his gaze as he seemed to remember that: one, they were shut away in their host’s conservatory one step from ruin and two, that she was the sister of the twin he’d once tried to seduce. And more specifically, the sister of the twin who’d looked down a pointed nose at him whenever he was near. Distractedly, she picked up the crystal flute still filled to the brim and eyed the nearly clear contents of the glass. It really did look quite delicious. “Do you mean five minutes?” Because there really wasn’t such a thing as five moments. Or was there? She raised the glass to her lips. With a growl, he snatched it from her fingers with such ferocity the exquisite liquor splashed her lips. “What are you doing, Lady Anne?” he asked, his voice garbled. “You are not sampling anything, my lady.” He set the flute down so hard liquid droplets sprayed the table. Yes, it seemed the roguish earl had gone all stodgy. She released a pent up sigh of regret. What a waste of perfectly forbidden champagne. Footsteps sounded outside the door and her head snapped up as suddenly, the ramifications of being discovered here with the earl slammed into her. She felt the color drain from her cheeks and frantically searched around. The earl cursed and taking her by the hand, tugged her to the back of the conservatory. His hasty, yet sure movements bore evidence of a man who’d made many a number of quick escapes. He opened the door and shoved her outside into the marquess’ walled garden. “Hush,” he whispered and propelled her further into the gardens. From behind the marquess’ prize-winning gardens, the moon’s glow shone through the clear crystal panes and briefly cast the earl’s partner in a soft light. The tall, voluptuous lady walked about the conservatory. “The Viscountess of Kendricks?” Shock underscored her question. “But she is recently widowed.” Granted she’d come out of mourning, but that was neither here nor there. Oh, he had no shame. Lord Stanhope clamped his hand over her mouth. He glowered her into silence and pulled her back, before the viscountess caught sight of them. Oh, the highhandedness! She’d never been handled thusly in her entire life. She glared up at him. At long last he drew his fingers back. She continued to study the lush creature, a recent widow with a hopelessly curvaceous figure. Anne frowned. Mother said gentlemen didn’t desire ladies with well-rounded figures but Anne quite disagreed. All the well-rounded ladies seemed to, for some unknown reason, earn the favor of all manner of gentlemen. The respectable ones. The less respectable ones. Even the old ones with monocles. A sly smile played about the viscountess’ lips as she paused beside the table. Even with the space between them, Anne detected the viscountess’ lazy yet graceful movements as she picked up the still full glass and took a slow taste of the bubbling champagne. The widow froze mid-sip and glanced around. Anne pointed her gaze to the moon above. As if a rogue, especially this particular rogue, could be ruined. She, on the other hand… She swallowed hard. She, on the other hand, danced with disaster. With good reason, of course. But still, disaster nonetheless. Anne glanced up the more than a foot distance between her and the earl to gauge the gentleman’s, er…eagerness. He appeared wholly unmoved by the woman’s none-too-subtle attempt at seduction. His narrow-eyed gaze remained fixed on Anne. Annoyance glinted within the hazel-green irises of his eyes. “Lord Stanhope?” the woman called again. Oh, really. She tapped a foot and wished the bothersome baggage would be on her way already. As charming as the Earl of Stanhope seemed to most ladies, she was quite confident that no gentleman could manage to lure her away from polite Society—for any reason. Lord Stanhope reached down between them and through the ivory fabric of her satin skirts, wrapped his hard hand about the upper portion of her leg, effectively stilling her moments. Anne’s breath froze and she looked at him. Her throat convulsed. Odd, they were just fingers on just a hand, so very uninteresting, something possessed by everyone. And yet, her skin thrummed with awareness of his touch. She swallowed again. There was nothing uninteresting about his fingers upon her person. “Stop tapping your foot,” he whispered against her temple. His words had the same affect of a bucket of water being tossed over her foolish head. He closed his eyes and his lips moved as if he were uttering a silent prayer. Which was peculiar, because she’d not ever taken him as the religious sort. “Lord Stanhope?” the woman called again, impatience coating her words. The earl cursed under his breath. “For the love of all that is holy.” And then, he kissed her. Hard. Christi Caldwell is the USA Today Bestselling author of historical romance novels set in the Regency era. Christi blames Judith McNaught’s “Whitney, My Love,” for luring her into the world of historical romance. 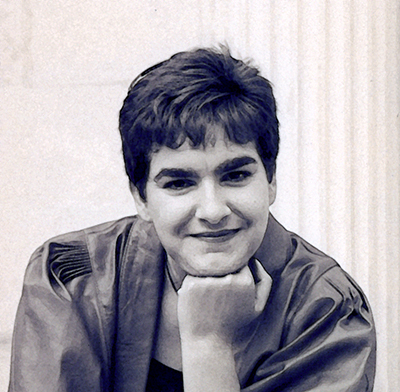 While sitting in her graduate school apartment at the University of Connecticut, Christi decided to set aside her notes and try her hand at writing romance. She believes the most perfect heroes and heroines have imperfections and rather enjoys tormenting them before crafting a well-deserved happily ever after! When she isn’t writing the stories of flawed heroes and heroines, she can be found in her Southern Connecticut home chasing around her feisty six-year-old son, and caring for twin princesses-in-training! Visit www.christicaldwellauthor.com to learn more about what Christi is working on, or join her on Facebook at Christi Caldwell Author (for frequent updates, excerpts, and posts about her fun as a fulltime mom and writer) and Twitter @ChristiCaldwell (which she is still quite dreadful with). Yes, I was not supposed to be here. I’ll tell you all about it after we congratulate Glenda who won Susanna Fraser’s book, Freedom to Love! Now for the boat drama. 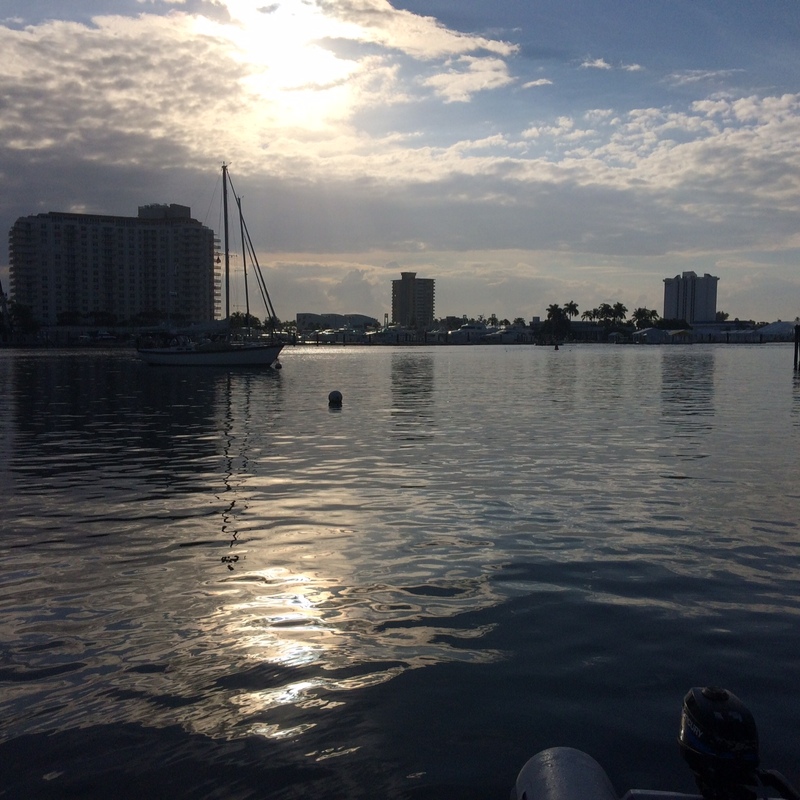 While we were in the Gulf Stream coming up from the Keys, we started taking on water. Not a thing you want to have happen. I made a quick call. We sailed overnight and put into a boat yard that morning. The problem was fixed, as well as several other items that we had not gotten done. 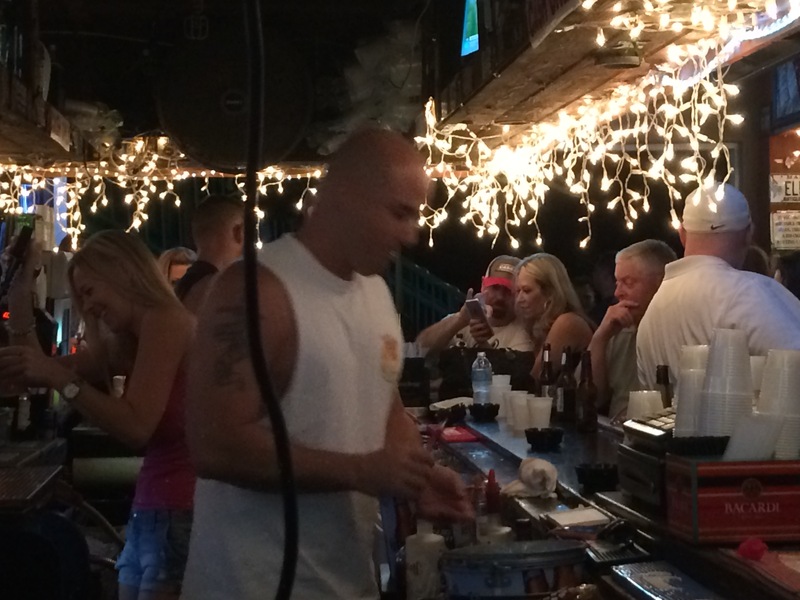 We were at the boat yard for a week and were fortunate to meet some other cruising couples who have become friends. 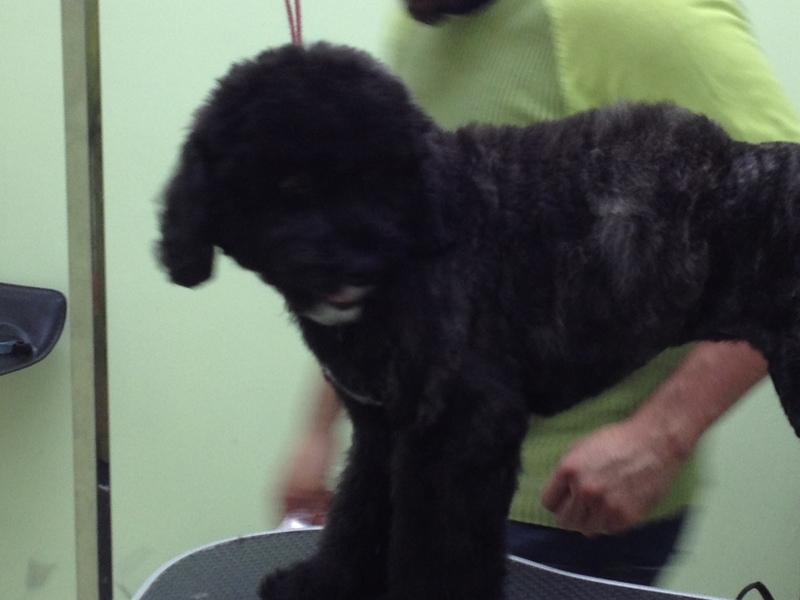 Alicianna and I both went to groomers. I bought some much needed prescription sunglasses, and green bags to help keep fresh vegetables longer, as well as a new bilge pump. Part of the reason we had so much water in the boat was that it had stopped working. Unfortunately, we missed our weather window. 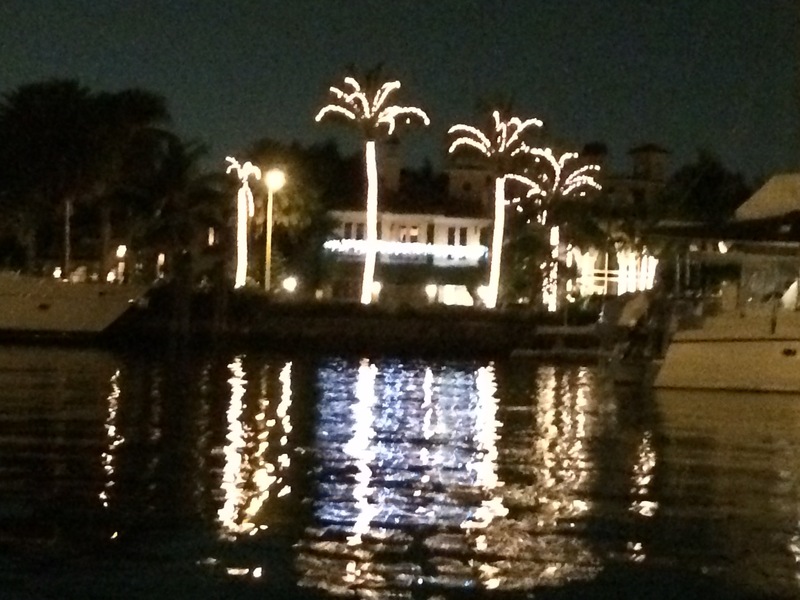 So we’re in Ft. Lauderdale until late Tuesday or Wednesday morning. If anyone wants to stop by, just let me know. 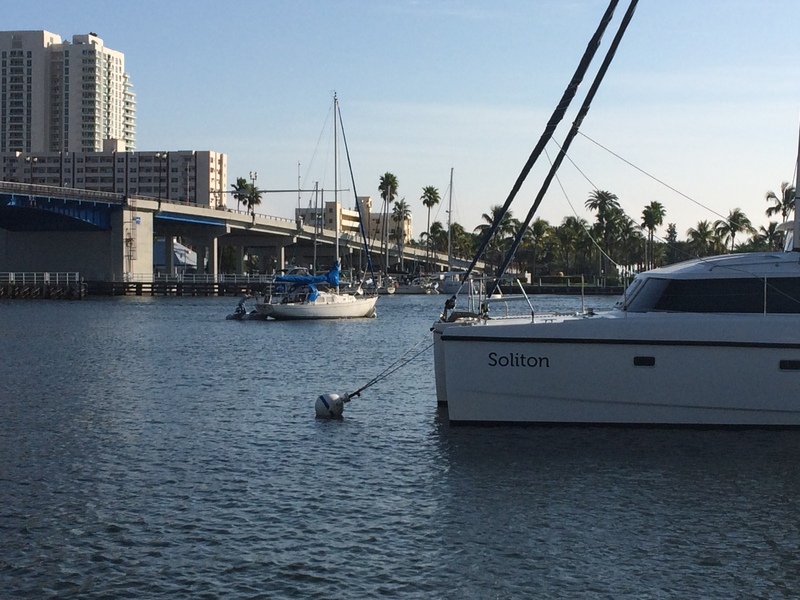 Here are some pictures of our anchorage in the Las Olas mooring field. I also got to make a quick stop at the Elbo Room. I hadn’t been there since around 1974. In the meantime, I have been writing the last book in The Marriage Game series. To say it’s been slow going, would be putting it mildly. I wrote a few scenes out of order. One of which I got to, the other I’m still slogging my way towards. The book doesn’t have a name yet. I’ve been playing with Miss Featherton’s Christmas Marquis. If you have any ideas, I will submit them to my editor, and if he picks it, you’ll get a copy of the book. 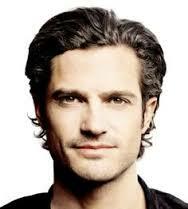 I had to give my editor an idea of what Damon, Marquis of Hawksworth looks like. As well as Miss Featherton. The premise of the book is that after experiencing two betrayals and heartbreak, Meg has decided to marry a man she cannot fall in love with. Damon, however, has other ideas. Here is an unedited excerpt. On Thursday Christi Caldwell will be back visiting, and on Friday Miranda Neville is here. Please make sure to stop by and welcome them. Also, be patient if you get stuck in moderation. If the wind and sea gods are good, I will be underway and on my sat phone wifi. Not the speediest of things.